So my time at the San Cristobal station finished just as it was getting interesting. The music, the conversations, the passion and the understanding all arrived while I was readying to leave. 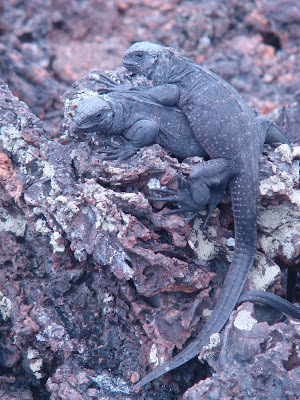 But now, before I head back to the mainland, I am taking a four day tour of the islands, and I finally get to see why Galapagos is so special. Yesterday I snorkled amongst miriad fish from the size of my finger nail to the size of me, in greys and blacks and pinks and blues and rainbows. 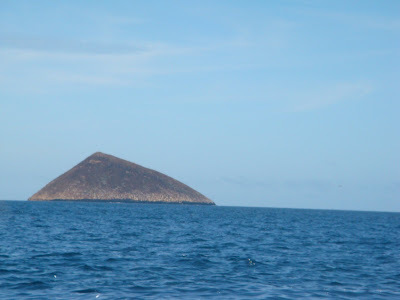 I swam with sea lions amongst the waves crashing against the great craggy rocks around the small volcanic island. I said hello to a penguin guarding its nest in the rocks. I saw friggate birds and blue footed and masked boobies, and just missed the tail of a whale as it passed by the boat. I caught a tan lying on the front of the speedboat for an hour. And that was just the journey to Isabella. Isabella is beautiful. 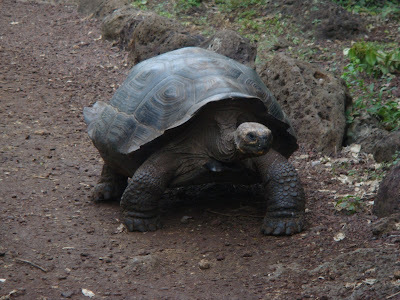 Yesterday evening we went to look at the giant tortoises before dinner, and then drank cerveza on the beach front. This morning we went horseback riding up to the rim of the volcano, and then hiked along the crackled landscape. The crater of this volcano stretches 11km in diameter, which is the second largest in the world. The effect of the spewn lava is just incredible. Like the moon, some said, or a different planet. It reminded me of Beckett; of a post apocalyptic world where life has ceased to thrive except for a few survivers wandering aimlessly into the bleak horizon. 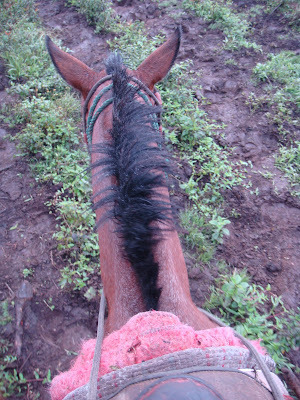 Then we rode back down the volcano, and got the horses into a gallop. I like to gallop, I have found; to have the wind whip by as you soar along is absolutely exhilerating. Then he broke into something faster than a gallop, and we were flying down the mountain. My right foot came out of my stirrup, and I held on with my leg against his neck, swerving vigorously from side to side on the saddle. I knew I was going to fall, because pulling the reins did nothing to slow him down and I had no hold on him as he careered along. So I saw an approaching area of grass, let my other foot out of its stirrup, and threw myself off to the right. The horse jumped past me, inches away, as I rolled onto the grass. Another thing to add to the list of near misses and daredevil stunts. I am writing this on a computer set up on a table outside a house they have converted into an internet cafe. They actaully brought me coffee, so I rate the service even though I am being eated alive by tiny flies. I have just come back from surfing for the first time, but I don´t have time to describe it because I have to shower before dinner and then head to the beach again for a bit of night swimming.